The head of the U.S. Food and Drug Administration says the agency has launched a "major operation to investigate and address" the "troubling" finding of a cancer-causing agent that may be contaminating a growing number of medications used to treat high blood pressure and heart failure. In a joint statement Thursday, FDA Commissioner Scott Gottlieb and Dr. Janet Woodcock, director of the Center for Drug Evaluation and Research (CDER), said they have developed a multidisciplinary task force to investigate trace amounts of N-nitrosodimethylamine (NDMA), a "probable human carcinogen," detected in some generic versions of the medication valsartan. The initial recall in July has now been expanded to include five manufacturers and other companies who repackage the affected valsartan products under a different name, and officials warned Thursday more products may need to be recalled. 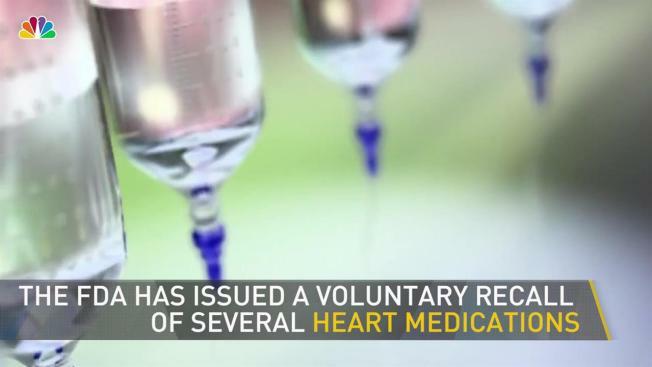 A third-party supplied the valsartan contained in the recall. The FDA recently updated the list of products affected and the list of those unaffected. "At the same time, the FDA is working to make certain that patients have access to the treatment that they need," the joint statement said. "Currently, more than half of all valsartan products on the market are being recalled. But prescribers can find a similar replacement product within the same class to substitute for patients who require this medication." The FDA said it is working with companies to take "swift action" to pull any products found with unacceptable amounts of NDMA from the U.S. market. The agency also said manufacturers would not have been testing for NDMA in valsartan because there was no anticipation such levels would be evident. "Recognizing these risks is based on a deep understanding of the chemistry involved in drug manufacturing, and the theoretical risk that an impurity could be a by-product of an essential step used in the manufacture of an active ingredient," the statement said. "When these impurities are identified, there are ways to re-engineer manufacturing processes to find pathways that don’t create these by-products." It continued: "As we develop a better understanding of the root cause of NDMA formation, and develop a way to detect NDMA in valsartan or other ARBs, we can ensure that appropriate testing is performed in the future." The FDA also said that while millions of Americans take blood pressure medication, the risk of many of them developing cancer because of the NDMA exposure is fairly low. CDER toxicologists and chemists estimated that if 8,000 people took the highest valsartan dose from NDMA-affected medicines every day for four years, which is the period of time officials believe the affected products have been on the U.S. market, there may be one extra case of cancer beyond the regular average cancer rate of Americans. Patients are urged to look at the drug name and company name on the label of their prescription bottles to determine whether a specific product has been recalled. If the information is not on the bottle, patients should contact the pharmacy that dispensed the medicine to find out the company name. If a patient is taking one of the recalled medicines, they should follow the recall instructions each specific company provided, which are available on the FDA’s website. If a patient's medicine is included in the recall, he or she should contact his or her health care professional to discuss treatment options, which may include another valsartan product this recall doesn't affect or an alternative option. In the meantime, the FDA said it will continue to improve its procedures for guarding against such impurity risks. "We will use the information that we learn from our investigation into valsartan to strengthen our oversight," the statement said. Read more about the agency's probe and NDMA here.